Suda 51's No More Heroes found its birthplace and home on the Wii. A violent game about killing assassins somehow managed to sit amongst the many family friendly titles that flooded the world-conquering system. Now Travis is back on a Nintendo platform, but this time in a shook-up spin off in the form of a co-op, top down hack and slash game with a twist. Travis Touchdown finds himself being attacked in his retirement trailer by Badman, father of Badgirl, an assassin Travis had dispatched in that Wii title many years ago. Amongst the fighting they both get sucked into a games console called the ‘Death Drive Mk2’, and now Travis and Badman must fight their way through multiple games in order to bring Badgirl back to life. A touch of Suda 51’s signature flair is interwoven throughout Travis Strikes Again, yet it's appearances are few and far between. The story is rather straightforward, instructing the player to seek out "Death balls" - the Death Drive Mk2s' games. Story beats are played out in retro-styled, text heavy, 8 bit cut scenes that are long, drawn out and unpleasing to look at. As for the plot itself, it has occasional enjoyable moments - mainly when breaking the fourth wall and taking a cheeky stab at its own budget and development - but the drawn out nature of its deployment had me praying to get back to hack and slash action. Two players each playing with a single Joy-Con is where Travis Strikes Again is at its most enjoyable. 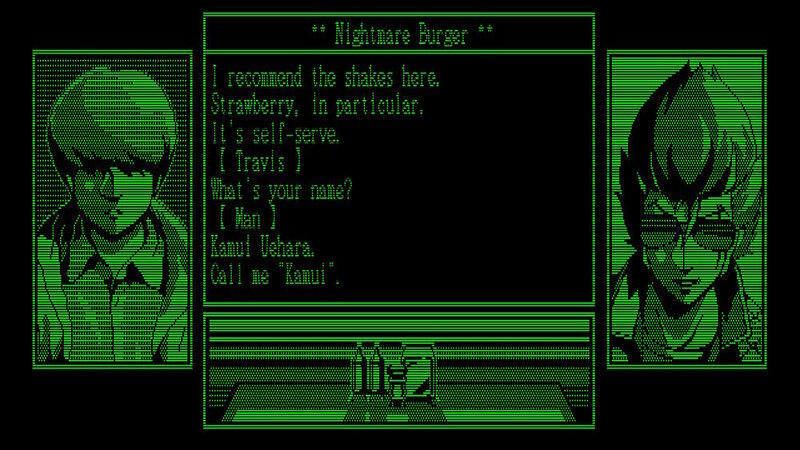 One player can play as Travis, with the other as Badman, throughout the entirety of the game’s main campaign. Controls are relatively simple, with jump and dodge, as well as fast and strong attacks being tied to the face buttons, while special moves are assigned to L and R.
Your main weapon can run out of charge, radically reducing your attack damage and charging it back to full power is done using motion controls - in a welcome throwback to the Wii game that launched the series. This recharge time creates a window in which you’re open to enemy attacks, adding a small amount of strategy - as well as some fear - in the more chaotic moments. 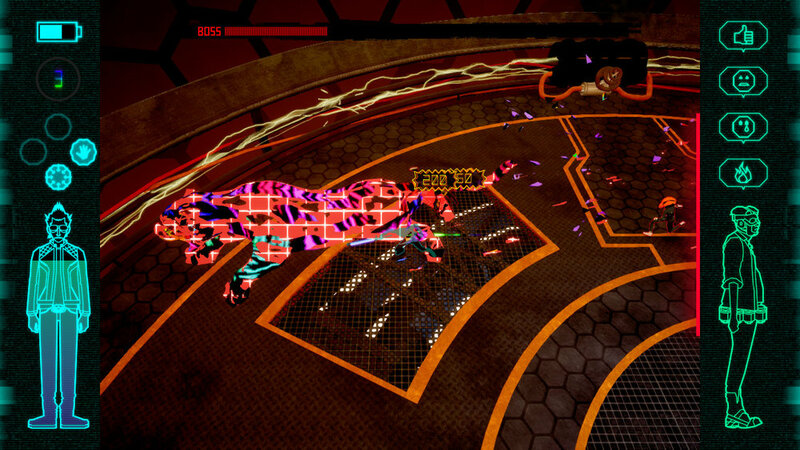 The majority of gameplay is comprised of simple hack-and-slash combat. This, coupled with the long and repetitive level designs, only serves to make the game feel more tiresome, especially when the same old enemies show their same old faces time and time again (albeit with the occasional palette swap). Each of the Death Drive’s games adds a slightly different mechanic or element to gameplay, but while that’s a nice idea, in practice most of these mechanics do not offer too much variation. They also offer little in the form of evolution throughout each of the worlds that these games create. Collectible T-shirts featuring various real indie games such as Dead Cells and SteamWorld Dig can be bought with in-game currency. I really enjoyed collecting them all, especially as some of the games are personal favourites of mine. I found myself eagerly kitting Travis out in different tops before each stage. Unfortunately, you never really get to see them during levels, as the majority of the time the camera is zoomed out way too far for you to make out which shirt you’re currently rocking. Skill chips can also be found throughout, which let you customise your characters with combinations of your favourite moves. You can also arrange and save them into load-outs, and I had fun trying to figure out my favourite combinations. Light RPG elements such as this are lightly sprinkled into the mix. Chopping and changing your load-out, along with the ability to change difficulty settings on the fly, gives you plenty of options to try if you get a little stuck. Boss fight giving you trouble? No problem, just drop the difficulty for the fight and change it back at the start of the next level. Travis Strikes Again has some interesting concepts and ideas that are lost in uninspired design, overstretched levels and puzzling execution of its story. It’s at its best when it’s not taking itself too seriously, which is the biggest strength of the title character, who repeatedly pokes fun at the game’s own expense. The simple controls and co-op play coupled with the light customisation features makes it a much more enjoyable experience with a friend, but playing though solo feels too much like a tiresome grind.